After our bankruptcy was discharged, I thought we were through with financial irresponsibility. 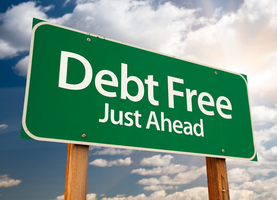 We had two paid off cars, and no debt except a 40 year 7.5% mortgage of $130,000. On a house what once was worth $125,000, now was valued at $65,000. We said we would never go back to the way it was. Our road started off with a bang, I decided I wanted a new car. I was tired of driving the small Chevy Aero, and wanted something bigger. By then my husband had gone back to work, so we had the income for a car payment. So I thought. Because we were so close after our discharge, the bank loan came back at 18%. Yet idiot me took it. Thankfully, I got our credit union to refinance it at 3.75 within 6 months. The credit card debt kinda of snuck up on me. Again our local credit union started me off small, and kept raising the credit limit for me. I just kept spending and spending. Sometimes, it was for luxuries that we really didn’t need, but other times, it was for the necessities that we needed. We again were living outside our means. Last summer, my husband and I decided to move closer to our jobs and to a better school district for our girls. I took 6 months, but I found a house that is 2 miles from my job, 10 minutes from my husbands job, and a much better school district. It was a for sale by owner, and what we considered a perfect fit. I’m not proud to say this, but I promised to be 100% honest, so I will admit, we walked away from the old house with the 40 year mortgage. We were allowed to as the debt was discharged in our bankruptcy. We convinced the owner of the current house to do a lease to purchase, and moved in the beginning of February . We are paying her 5% APR (she holds the note) and have a refinance deadline of November 2019. Yes this stresses me out. A few weeks ago, I finally hit rock bottom. I had convinced my local credit union to do a debt consolidation on some of our credit cards. I swore I would cut them up, and start living like a responsible adult. I failed. Two of the cards lowered my credit limit so they are not as high, but the rest are right back where they were. I am very ashamed to find myself in such a low place again however this time its different.We are not walking away from one red cent of what we owe. We can and we will pay down our debt. It won’t be easy, in fact, I’m sure its going to be very hard. But for the 1st time, my husband and I are on the same page, and there are no secrets. The future is now. We are cutting everything we can to have more to throw at debt. I am working on a post explaining our income and expenses. We are signed up to start Dave Ramsey’s class in the middle of September through our local habitat for humanity. I’m excited because at the same time we have our class, they are also holding a kids class that follows Dave’s class for kids. Hopefully, that will give our girls the foundation to be smarter with money then their parents are. Its something I wish I had as a kid. Thats our full financial story. Like I said, I am working on an income and expenses post that I am sure everyone will help me whittle down. I do promise to be 100% truthful in my posts, and I have thick skin to read the responses to them. I was never good with credit. When I was 16, Lane Bryant sent me a credit card. I had ordered from there catalog for several years. I don’t remember filling out a credit application, just this very pretty purple piece of plastic coming in the mail, and I then could order clothes and pay a small $25 a month until they were paid off. Easy, right? I had my first charge off on my credit report at 18. I was a single mother at the time, and on welfare. The next step was to go back to work, and I needed a car. But with a new job and a small awful credit file, I needed a co signer. I don’t know how I did it, but I talked my Dad into it. I bought a 1990 Ford and went to work 3rd shift. I behaved at 1st, making payments on time, and then I moved out on my own. I lived in an apartment with my son, and my soon to be husband. (now my ex husband). Living on my own was hard, and things started to slide. First my car insurance didn’t get paid, then it was canceled. So the finance company added their insurance to the car. Then I fell behind in the payments. Eventually I had to give the car to my Dad, and borrow his paid off car to drive back and forth to work. He was nice about it, but swore he would never co sign for me again, and he never has. Not that I would ask. When my ex and I got married, we moved south with the military. He then took over the bills. I had given my Dad his car back when we moved, so we were down to one vehicle. We decided to trade his truck in and buy 2 cars, one for each of us. His credit was good, so it was no problem. Fast forward a few years, and we are out of the military and permanently living in the south. Thing are tight, and my ex and i fight about money a lot. Eventually we end up splitting the bills 50/50, and each of us have to pay out of our own paychecks. He doesn’t care about any credit cards, just that if they are in my name, I have to pay them myself. Me, having no self control with money, rack them up. We split in 2001, and he walked away with a paid off truck. I was left with 10,000 plus in credit card debt, student loans, and a single wide mobile home with a 20 year mortgage. I then decided that I wanted a new car. The one I had was with a credit union, and I was upside down a lot. But it was in my ex husband’s name. So, I let it go back, and bought a car on my own. Took out more credit cards. Move to a rental house that was $250 more a month and let the single wide trailer go back to the bank. Don’t get me wrong, I was making it, but by the skin of my nose. By then I was at my current job but a single mom of 2 kids. Do you know how embarrassing it is to have collection agencies call you at work, while you are a bill collector for your job? One time, they even faxed my boss about my debt. I blamed my ex husband, and prayed that they would stop one day. Then the rental house caught fire. Thank goodness I had renters insurance. I had a ton of cash, and a spending habit that I had not fixed.I found a new place to live, a rent to own house. I had one year to rent, and I had to get the mortgage in my name. I did it in 6 months. That was the height of the housing bubble, and I got a 11.75 % variable APR mortgage on a $125,000 house. But I had a ton of money from the insurance, that made it easy. My spending habits didn’t change. My kids and I had more stuff then we knew what to do with. I then met my current husband. He is 6 years younger than me, and still was living at home. We has a speedy courtship, 4 months from our 1st date to our marriage. The money from the fire had run out by then, and he didn’t have a well paying job, so I robbed Peter to pay Paul to pay for the big wedding we had. The mortgage company did the 1st loan modification on the mortgage within 6 months. They lowered my payment and my interest rate to 7.5 % fixed. I thought everything would work out. Traded and bought a few vehicles, and racked up more debt. Was kinda of keeping my head above water, then my husband got sick. We then had huge medical bills that included a bill for a cornea transplant. Everything got past due, even the house again. We went and filled out the paperwork to file chapter 13 bankruptcy but didn’t have the filing fee until we got paid on Friday. Thursday, I went out my front door to goto work, and my car was gone. It had been repossessed in the middle of the night. So, I borrowed the filing fees to file a day early, and the next day, the lawyer got my car back from the bank. Again, things were fine for about 6 months then hours were cut. My husband had to find a new job, and took a $2 an hour pay cut. That hurt. Our Chapter 13 payments were self pay, so we stopped them. And our plan was dismissed. We went back to the attorney, and asked what to do. He said to keep the house, we would have to file chapter 13 again, but reduce what we were paying in the plan. We gave back my car, but kept my husbands truck. I went out and found a mini van on a buy here pay here lot and got that for transportation as our family by then had grown by our twins and we didn’t fit into the truck by then. This time my pay was garnished for the payments, and my take home was about $250 every two weeks. My husbands was about $600 every two weeks. Everything else went to bankruptcy. It was very tight. So tight, that I even went behind my husbands back and got 4 credit cards while in bankruptcy. See the trend. Then the layoff. My health insurance at the time was 100% paid by my employer, but my husband carried the girls and himself. To add him and the kids to my heath insurance was $300 a paycheck. His unemployment was $115 a week, and I only was clearing $250 a paycheck. The bankruptcy payments had to stop. My attorney got the trustee to stop the garnishment, and I put everyone on my health insurance. We saved up and filed income taxes, and converted to a chapter 7. We bought 2 salvage titled cars, and let the truck and van go back to the banks. We did another modification that included stretching the mortgage to 40 years from 30 years, and kept the house. We were discharged from chapter 7 in July 2013.